President-Elect Trump with South Carolina Lt. 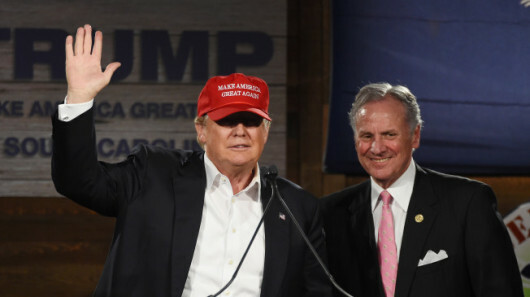 Governor Henry McMaster - A team to make America and South Carolina great again! For my friends outside of South Carolina who may not understand the appointment of Nikki Haley as United States UN Ambassador -- a woman to whom the President-Elect owes NOTHING -- this is more a maneuver to reward South Carolina Lt. Governor Henry McMaster, a popular leader to whom the President-Elect owes a great deal. Nikki Haley is a powerless and disliked Governor who has attempted to achieve national recognition by betraying the people of her own state and conservative principles. She is an opportunist and has no future in South Carolina whatsoever, and her success to date has depended on the same factor which helps elect Lindsey Graham to the United States Senate. Democrat voters have known that they are unlikely to obtain anything closer to one of their own and have therefore cast their votes for the RINO candidate. Lt. Governor Henry McMaster, on the other hand, is a popular figure who will be a well-respected, popular Governor. He was also the most prominent elected official in South Carolina to support the President-Elect in South Carolina's "first in the South" Republican primary. Trump's win here was the first in what became an unbroken and unprecedented string of victories throughout Dixie. Haley's role at the UN will be that of a TV news anchorwoman; she will read statements prepared by others in the White House and State Department and take the slings and arrows of a world community hostile to the United States. She will have no policy role and will be a place-filler until someone qualified can take the job, unless the Trump administration can extract the US from that enormous waste of money. Many of us will be grateful for an ingenious way to get Haley out of the state. Now South Carolina will have a superb, new Governor who reflects conservative South Carolina values and will be an important ally to the Trump Administration in making America great again.